How is your life? Are you done being sick? Did the medicine work? JOshua is inviting you to a Hanukah in July party. He was inspired by the Hanukah cookie kit in the cupboard. Have you ever made latkes? The potatoes in our garden are ripe and yummy (we made mashed potatoes last week. mmmm). We will leave a few for you maybe. The yukon gold ones taste soooo yummy. Better than the store's. Today I went outside and was eating on the picnic table, dribbling my toes in the pool... when I heard some clucking that didn't sound like it was coming from inside the coup. 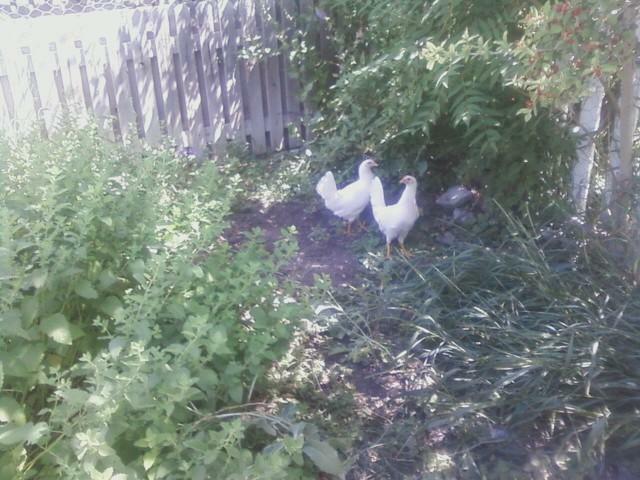 Sure enough, our two little white hens had escaped! Yesterday I had put them in the big-chicken coup. I don't think they like it. Tonight they got out again, even though we keep trying to fill in all the holes. The funniest thing they were doing today was trying to climb to the very top of the stick/perch thing in the coup. The one below kept pushing the one above it to make it go higher. They had to keep flapping their wings to keep their balance. One they made it to the top, they looked ridiculous- both trying to be the tallest and flapping and flapping. I wonder if they decided to sleep there. I don't think the big chickens are letting them in the little ours. Poor kids. Joshua wants them to be name Pyramus and Thisbe (from midsummer night's dream). I caught the teenage chickens sneaking out of the coup . . .
We had fun with the family. Joshua survived the in-laws taking over the house, though it was pretty crazy. I think Beccah had fun at EFY. She made a whole bunch of really good friends, which I think is the most important part. She is excited to Skype all of them. She said the food was horrible, esp. on her birthday, but hopefully she learned some spiritual things too. We had a party when she got back. Before EFY Joshua and I took her to cedar city to see the shakespear festival. Which she thought was the most ammmmaaazing thing in the world. We were pretty proud of ourselves. It was a cool play. We stayed with Debbie Bell who treated us so good, it was like staying in a hotel, Beccah said. Other than that, I don't remember doing much. We ate some dumplings, they were yummy. And some chicken and dumplings. We had a fun 4th of July - watched the balloons, watched the parade, visited colonial days where I ran into a family I lived with on my mission. Then we went to the Oakley rodeo. It was pretty fun. Oh, and we have been packing and packing and packing! I think that everything except our clothes are packed. We are just using Jonathans stuff. It's a pretty good arrangement. We are still trying to figure out how to get our stuff to Indiana. The company we were going to use are out of pods. Now we might ship stuff or something. We'll see. And we might leave a week earlier than planned. Give us more time to hang out and get set up in Indiana. There is a lake there, hopefully it is fun to visit. We went with Josh's family to Snowbird where we had lunch and rode the alpine slide. It was pretty fun, even though I had to try not and go too fast. It was funny watching Joshua's Gpa Wheatley go down it :). After the reunion stuff we met up with the fam at the lake. We had fun boating. Joshua even went on the tube in his jeans, and fell off. He said it was fun :) I jumped in to join him... with my phone in my pocket and his glasses clipped on my shirt. Ooops! The glasses didnt fall off, and my phone has since recovered. I still cant make happy faces with it, but I think that is a problem from its last swim. The night before they left we had me a baby shower. The ladies all said they had fun. I filled up the pool and put my feet in it while I opened presents. Kaisa and Evy's little baby had fun getting all wet! Nothing like a pool party baby shower ;) I got lots of cute clothes and baby toys. It was a little weird and I didnt feel like I should be having a baby shower. The baby is moving a whooooole lot inside of me, though! It kinda makes me nauseous sometimes. And once in a while it will wake me up! It was punching my tummy the other day, and Jonathan could see my belly moving from the outside. It is kinda fun (but a little weird!) to feel and know there is a littler person hanging out and movin around inside your body. Crazy. Next time it moves a lot I will take a movie and send it to you ;). Another thing we did is go to Jonathan's Chinese fair. All the students had booths and stuff. We had dinner and used byu money to buy chinese souvenirs and pictures. Beccah got a bunch of stuff for her girl's camp cabin. We got a little lantern with the words "boy child" painted on it. Cute ;). Jonathan has been really busy teaching his class every day and planning lessons. I think he is enjoying it and it is a good experience. He is one of like 8 teachers, and most of them are a lot older. And my brother is getting married! A little weird, but exciting. They are getting married in Oct in NC. Actually, in the Columbus SC temple. Looks like we are all taking a trip. Hopefully I am not too pregnant and we will drive there. Then at thanksgiving they are having a CA open house. Sometime between there they will have a Utah party. Her colors are yellow (kinda a mustard color), dark purple, and green. Yesterday they went to target and used the little gun to register for things. Always an adventure. He wants to register at Home Depot. I told him to go for it :). The lindon tree outside is blossoming, and the smell is like the most smelly perfume ever. When we use the swamp cooler it blows in all the smell. It is pretty sickening. Ooof. Tonight I babysat for the bishop's kids. They gave me a haircut (pretend) and we played kickball, rode bikes and read books. When I put them to bed they kept yelling "babysitter!" But I ignored them like a good parent would do. It was funny. I would rather be called that, though, than sister wheatley! That makes me sound too old. I am going to post this on my blog now. It is very long and blog worthy. Was your pot all in one piece, or was is kinda crumbly? What are you doing this weekend?